Versatility, distance and control all in one space-age package. 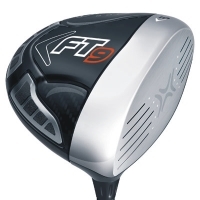 The FT-9 Driver was designed to deliver the most creative shot-making you can think of. With the addition of Hyperbolic Face Technology, ball speeds across the entire face have been dramatically improved to generate even more distance. Draw configuration with the help of external web weighting that helps precisely position the center of gravity to promote the desired trajectory and ball flight for the desired shot shape. Hyperbolic Face Technology: Hyperbolic shaping is Callaway's cutting-edge driver face design. Mathematics and engineering combine to create their highest ever ball speeds across the entire face. Fusion Technology: Proprietary technology creates maximum perimeter weighting and more discretionary weight by combining a carbon composite body with the titanium face cup. This allows for precise positioning of the center of gravity, which increases stability on off-center hits and enables ball flight customization for shot-shaping control. OptiFit Weighting System: Draw version for promoting a draw. Visible External Web Weighting: Fusion Technology allows the web weights to be precisely positioned for a center of gravity that generates the desired Draw ball flight, letting golfers hit longer and more accurate drives.